All the fun of the Flea Market can be enjoyed Saturday, Aug 19, along with Main Rummage Sale. Rummage Pre-Sale takes place Friday. DEEP RIVER — The Deep River Congregational Church, 1 Church St., Deep River, has been preparing for its Annual Flea Market and Rummage Sale which will be held on Aug. 19. 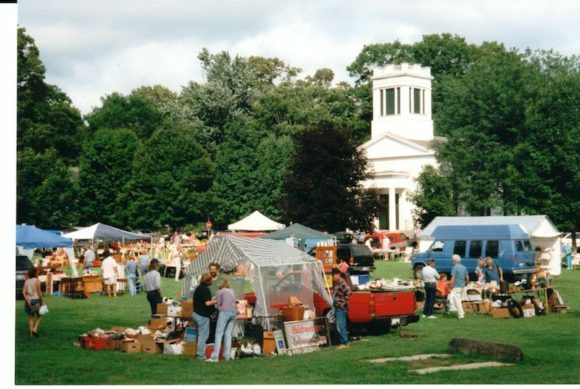 The Flea Market, which is held on Marvin Field and on the grounds around the church, runs from 8:30 a.m. to 3 p.m. with over 80 vendors, who bring a wide variety of items to sell, from antiques to hand crafted pieces. There will be a variety of fresh baked goods for sale, prepared by church members and friends. Refreshments may also be purchased throughout the day: coffee and doughnuts in the morning and hamburgers, hotdogs, and side dishes throughout the day. There are only a few 20 x 20 foot spaces available for $30, and you can reserve yours by contacting the church office for a reservation form and map. The Rummage Sale Committee has been collecting items since June for our Rummage Sale during the same weekend as our Flea Market. It will be a two-day event running from Aug. 18 through Aug. 19. All are invited to a Rummage Pre-Sale on Friday, Aug. 18, from 6 to 8 p.m. for a $5 admission fee. The Main Rummage Sale will be held from 8 a.m. to 2 p.m. on Saturday, Aug. 19. For further information, contact the church office at (860-526-5045or office.drcc@snet.net) or check out our church web site at www.deeprivercc.org.